We all know deep down the dog or cat think they are the boss. 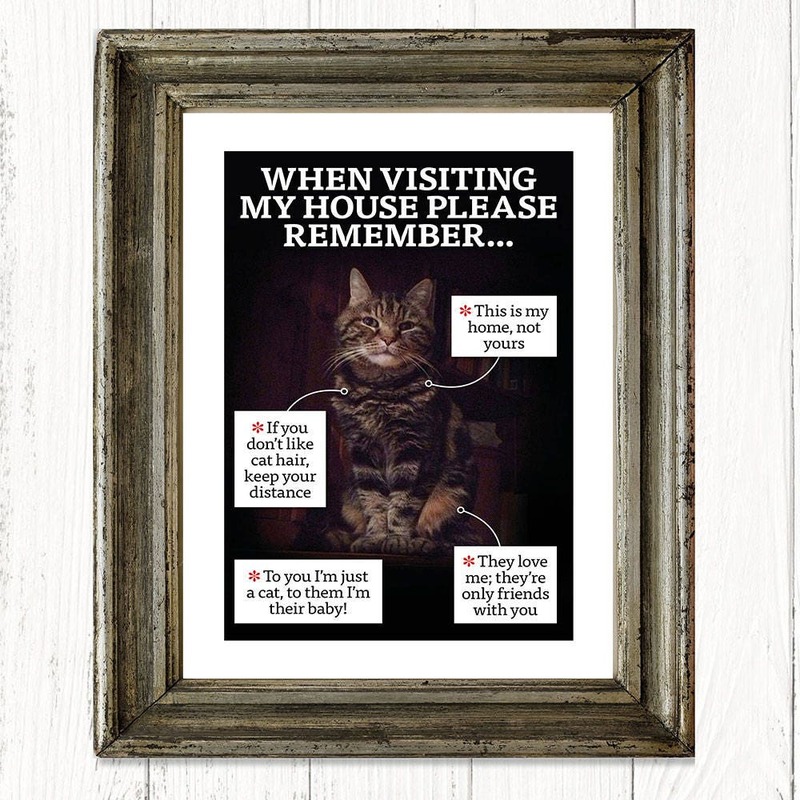 Let visitors to your home know that, when all is said and done, they must respect that your dog or cat comes first with this funny, personalised with a picture of your dog or cat art print ‘When visiting my house…’ rules. An ideal gift for dog lovers and cat lovers for Mother’s Day, Father’s Day, birthdays, Valentine’s Day, Christmas or just because. 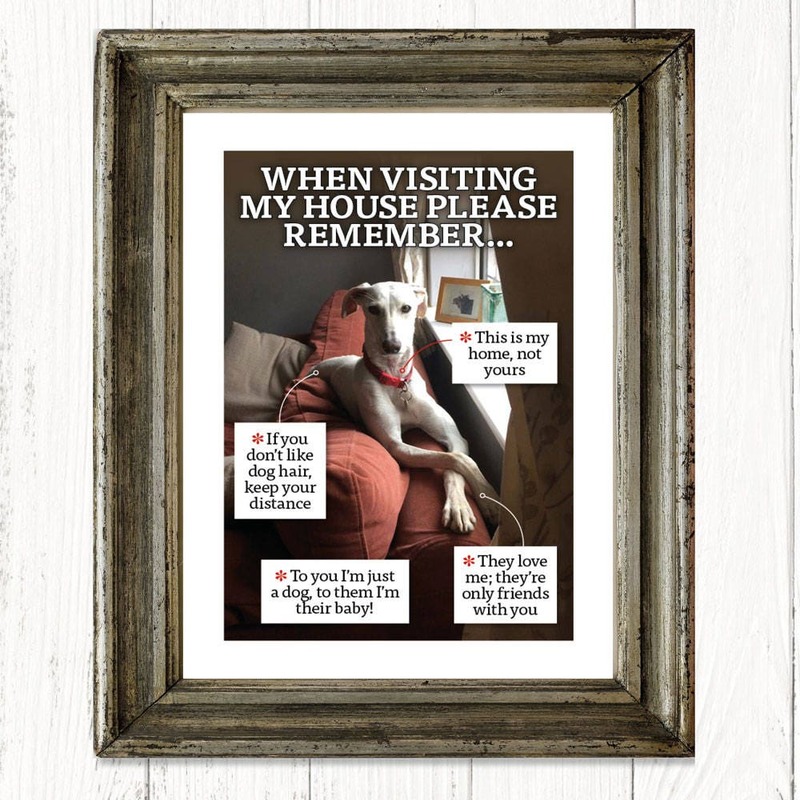 Simply add the correct sized frame and hang your dog or cat print on a wall or stand on a shelf where visitors can see it. Once you have placed your order, send us an Etsy conversation and attach your image or send us an email to info at shakepaws.com and don’t forgot to quote your order number and attach an image of your dog. Please send us your favourite portrait image – taller than it is wide – of your dog or cat, one that includes background space around him or her. A good quality image taken with a camera phone will do just fine. Our in-house Photoshop genius, Jane, can deal with most anomalies (within reason – a blurred image cannot be corrected). Pictured in the example above is our Dotty, and she’s most definitely not for sale! Original artwork by Shake Paws. Frame not included. The print will be sent flat-packed in a cello bag protected by a sturdy card-backed ‘Please do not bend’ envelope. Colours may vary from those seen on screen due to different monitor set-ups. Premium uncoated 250gsm FSC-certified card. A4: 297 (H) x 210mm (W) (approx. 12 x 8in). Fits a standard A4 frame, which can be found at a wide range of vendors, both on the high street and online. Any personalized animal print has to be good!